A while back, I ditched the HP tower for a beefed-up refurbished Dell I’d bought for a project. I didn’t like the HP much, despite replacing Windows 7 Home with Windows 7 Pro. The Dell had one very big attraction: Load Windows 7 onto most Dells, and you’re pretty much done once the updates install. That’s it. I also installed a 1 Terabyte drive (That’s 1 million Gigabytes for the technically uninitiated). I would never, ever run out of space. 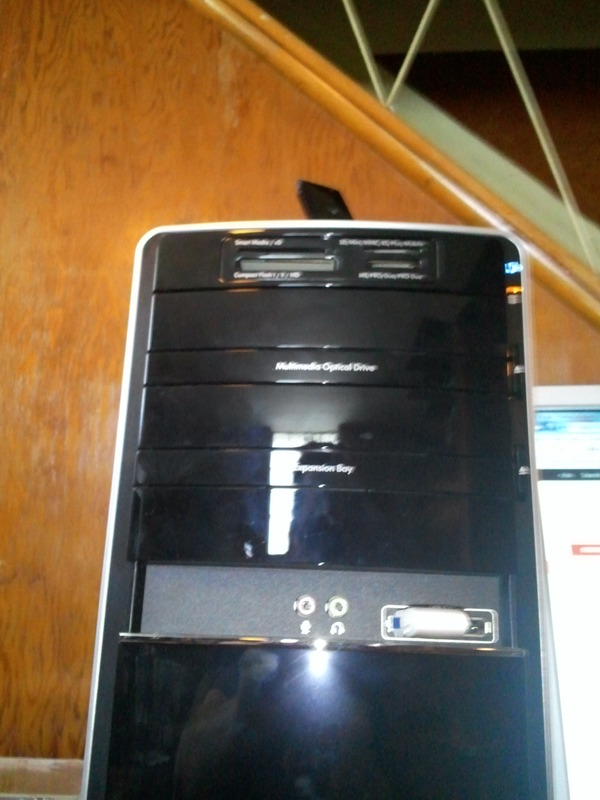 But the HP has a dual core processor, 6 GB of RAM, and lacked only the 1 TB drive I put in the Dell. Despite the Dell taking up less space on my desk, it showed its weaknesses from the get-go. The wireless fob I plugged into it could barely pick up the router on the other side of the house. Its processor, while a dual core, was one of Intel’s early consumer versions of that processor. Fast, yes, but noticeably less so than the HP’s. I decided to switch back, taking my 1 TB drive with me. Why does my video look like garbage? Why can’t I get a wireless signal? I can’t do anything with this until I get online. Had a broken wire from when I put the video card back into it. Oops. Off to Walmart for the $30 cheapie. Works beautifully. Then again, I remember it hadn’t been that long ago when I bought a wireless card for another machine, and the clerk at Microcenter told me $50 was a bit pricey. Nita was with me. We almost burst out laughing, having both bought cards back when $70-90 was the norm for a low-end card that now is good for little more than picking up stray broadcasts of Radio Free Mordor on cloudless nights. If anything, this bargain bin unit does better than the original installed by HP. If this had been a Windows XP install, I would still be tearing my hair out. XP, and Windows 7’s mutant predecessor, Vista, required hunting for drivers ahead of time. It also requires more updates. If you don’t go with Service Pack 3, an XP install can go from an evening project to three days before you can do a file transfer and start loading Office and other apps. The other thing Microsoft needs to resolve is this constant need to reboot after an installation. It’s 2012, Mr. Ballmer. I don’t want Windows 8 with its Metro interface and lack of a Start button. (OK, I do, but only when the Surface tablet comes out, not on my PC.) I want Windows 7 to not reboot everytime something major reinstalls. Unix doesn’t do this, and it was written in 1968. Fix it. That said, I’m pretty happy with the way things went. My main problem with the HP was bloatware. The original image on the HP had a clunky music player that crashed everytime you plugged in a thumb drive or unplugged the iPod (which didn’t talk to the player in the first place.) I had to uninstall all sorts of crapware from HP, AOL, and Yahoo. And HP never missed a chance to interrupt what you were doing to tell you that some application was sucking up resources, then suggest you kill Firefox to save on memory. It was the HP diags. So I went for the clean install of Windows 7 Pro. No bloatware. No HP diags. Everything on that machine is what I installed. Still not happy about the wireless, but whose fault was that?